Here is a brief summary of the PSI exchange offer. It's a great deal - why would anyone become a holdout? €31.5 euros of new Greek Bonds containing Collective Action Clause under the British law with special features like the Co-Financing Agreement. Note that this doesn't mean 31.5 cents on the euro because the new bonds are nowhere close to being worth par. The new bonds will be in 20 different maturity tranches ranging from 2023 to 2042. Coupons will step up over time: 2% through 2015, 3% for 2016-2020, 3.65% in 2021, and 4.3% after that. This creates a principal amortization structure similar to a US 30-year mortgage (except the amortization starts in 10 years rather than immediately). 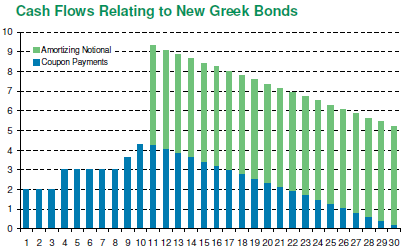 Accrued interest on the old Greek Bonds paid with EFSF 6m T-bills. This results in the face value haircut of 53.5% and an NPV haircut of over 74% (less than 26 cents on the euro) ignoring the GDP-linked notes. The NPV of the GDP-linked notes is €1-2 assuming they pay maximum amount. And for those who believe these will pay the maximum amount because the Greek GDP will recover, I have a bridge in Manhattan I’d like to show you. Of course don't call this a Credit Event yet, because it is a totally "voluntary" exchange. There is no default - just some bonds changing hands at 26 cents on the euro.